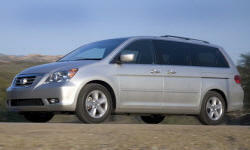 Honda Odyssey Pros and Cons | Page 1 of 5 | Why Not This Car? I have to say this car has been very reliable. I have nothing to add, it just goes always. Our 2013 Odyssey has racked up over 145k as of May 2016. We drive A LOT! So our use is not normal by any means. If you want to know how our Odyssey held up, this may be the review you want to read. We bought this Odyssey off-lease with 38K miles on it in early 2003. It is now late 2014, she's got 201K on her with no powertrain work ever, apart from normal upkeep. She aged very gracefully, and is still in daily use. 2011 EX-L has been the most comfortable car I've owned. Got it used, so we got great bang for buck. Love the overall feel of the van. Obviously driving the van isn't "cool", but it sure is a great family option (twins on the way). Looking forward to years of great Honda experience. The Honda Odyssey is a wonderful vehicle that I felt was safe for my family and met our needs. Although we had trouble with the sliding doors and the alignment, the pros far outweighed the cons. 46000 miles in 2 1/2 years of ownership. Van had 45000 miles on it when I bought it. As I mentioned elsewhere, lost a 2001 Odyssey to transmission failure, so keeping on top of that as much as I can with this one. Yep, I'd buy the car again. My family needed a minivan for long distance travel and hauling in comfort to grandchildren 2000 miles away, and more immobile than we were. Liked the engine power of the 3.5 liter.rnReceived an excellent deal in MA.rnHad a bad experience with Toyota dealership. They were kind of sleazy. Odyssey has reported reliability issues. Lots of features for the price. Very comfortable and everything is well organized. Noisiest of the vehicles we test-drove. The Odyssey has the best seat setup of any minivan on the market, by a large margin. Standard 8th seat, which is usable, easy to flip the 3rd row, adjustable 2nd row without floor rails to collect debris from kiddos. Can fit my motorcycle or construction material or people in comfort. I had two Honda Accords that were perfect. Actually, the Odyssey we had (2007) was not that good, but we had bought it used so we decided to give a new one another chance. Significant wind noise and very noisy suspension and significant noise coming from the rear compartment of the Honda. Comfortably fits the dog crates I often travel with.